Thin, specific used in industrial machines. 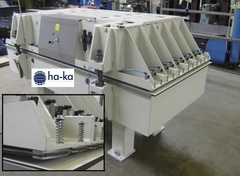 The ha-ka lifting bags of the AS/CR type are manufactured from reinforced NBR rubber hose, equiped with stainless steel or brass air connections. 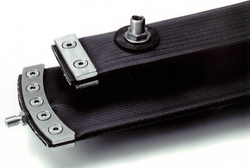 You can choose several different air connections: Vertical, threaded, connections mounted in the hose material, horizontally mounted threaded connections between the end plates, or horizontal air supply hose connections also mounted between the end plates. The lifting bag hose is hermetically closed on both ends with a vulcanising sealing and reinforced with stainless steel end plates. The lifting bags can be built in compact area’s and are a perfect alternative for short stroke air cilinders. Applications: Clamping, pressing, brake mechanism, lifting mechanism, conveyor systems, paper industry, food industry, etc. Maximum working pressure, dependable on the type, 5 to 8 Bar. Maximum lifting height (stroke) 115mm. Available in width from 33mm up to 204mm. Alowable temperatures for the hose material from -35°C up to +100°C. Air connections in stainless steel AISI 303 or brass.